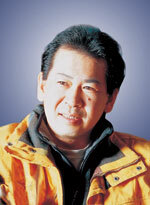 Yu Suzuki joined SEGA® Corporation in 1983. Suzuki is widely recognized as one of the many forefathers of console video gaming for his many contributions in computer animation and 3D graphics. Yu Suzuki is an Executive Officer of SEGA Corporation overseeing SEGA's worldwide content strategy. Over the course of his career, Suzuki has vitalized the video game industry both technologically and culturally. In 1993, he created the internationally renowned arcade hit, Virtua Fighter, which spawned the 3D fighting genre. The Virtua Fighter series is recognized for its contributions in the fields of Arts & Entertainment and is the only video game on permanent display in the Smithsonian Institution's Permanent Research Collection on Information Technology Innovation, at the Smithsonian's National Museum of American History in Washington D.C.
Suzuki is best known for his many industry firsts and genre-breaking games. In 1985, Suzuki created the world's first real-time simulation arcade game, Hang On, followed by Outrun and Space Harrier. Suzuki has delivered some of the world's most celebrated video games including AFTER BURNER, F355 Challenge, and the Shenmue series. Most recently, Suzuki has delivered Virtua Fighter 4 for Playstation 2, which was hailed the "Best Fighting Game Ever Made" by Official U.S. Playstation Magazine, and Shenmue II for Xbox. Both titles were developed by SEGA-AM2, a SEGA development studio, under the direction of Yu Suzuki.